You are currently browsing the tag archive for the ‘Stanmore’ tag. 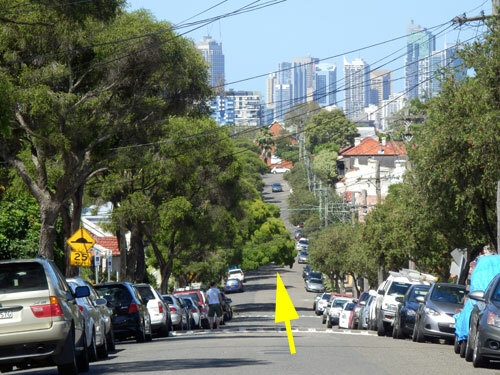 The arrow points to the street tree to be removed. As you can see, it is the best in Westbourke Street. 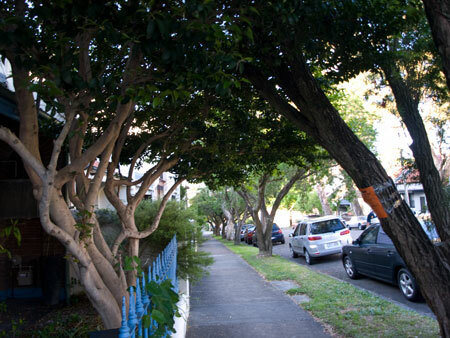 Marrickville Council has given notice that they intend to remove 2 street trees in Stanmore. 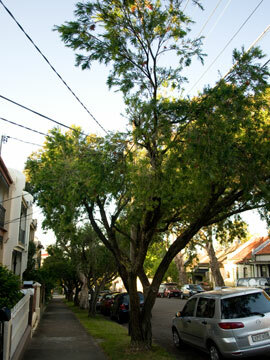 Tree number 1: Chinese Tallowood (Sapium sebiferum) at Westbourke Street, adjacent 48 Charles Street. The tree is causing significant damage to the adjacent building which cannot be over come by any reasonable or practical means other than removal. The tree presents an unacceptable risk to the private property. Council says they will replace this tree with a Crepe Myrtle (Lagerstroemia Sp.) during the 2012-2013 replacement tree-planting program. As I drove down Westbourke Street I admired a lovely tree that cascaded across the street. Of course, the tree up for removal turned out to be this tree. It is entirely unsuitable for the location & sad as it is, I agree that it needs to go. The roots are large & head straight into the property 1-metre away. I will not be putting in a submission. 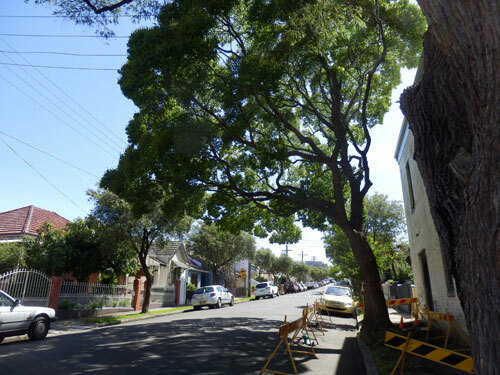 Tree number 2: Black Locust (Robinia pseudoacacia) at the rear of 14 Alfred Street Stanmore (public reserve). I could not locate an Alfred Street in Stanmore. There is one in Marrickville & one in St Peters. Therefore I did not go & look at this tree. The tree exhibits poor form & structural condition as a result of extensive wood decay & borer damage throughout the trunk. The tree is poorly located & is likely to be a sucker from a neighbouring tree of the same species. It presents an unacceptable risk to the public & property. The Deadline for submissions for both trees ends on Friday 11th January 2013. Westbourke Street tree to be removed. The tree was chopped down on 19th January 2010. It has not been replaced. Because the tree cascaded over the road the loss of this tree had a large & negative impact on the streetscape in this location. 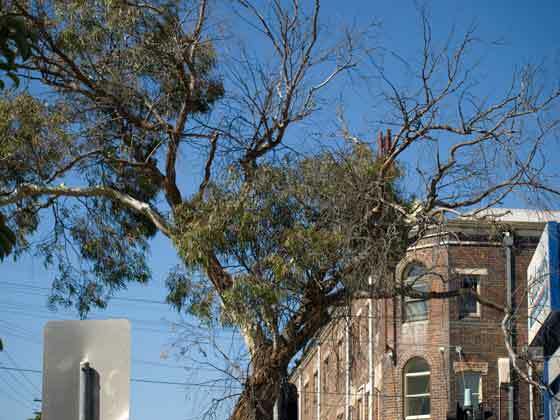 I hope that Marrickville Council do decide to replace this street tree as part of the 2012 tree-planting program. 2 planting seasons have passed & still this space remains empty despite that a new tree was promised for this location. The red is the canopy that I think will remain if the 2 offending trunks are removed. The blue is part of the Fig tree canopy. 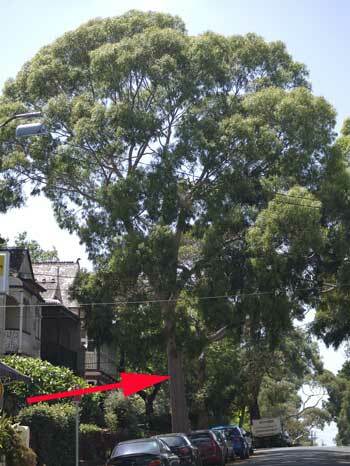 Marrickville Council intends to remove a Willow Bottlebrush (Callistemon salignus) outside 54 Durham Street Stanmore. Excessive & repeated lopping for clearance of electrical supply, creating an uneven canopy with a large amount of wind exposed canopy over dwelling. 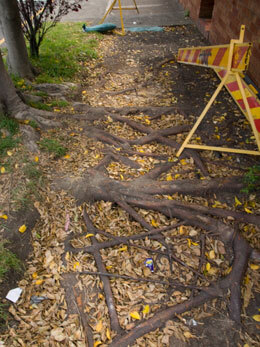 Repeated damage to council’s footpath infrastructure by roots of the subject tree. 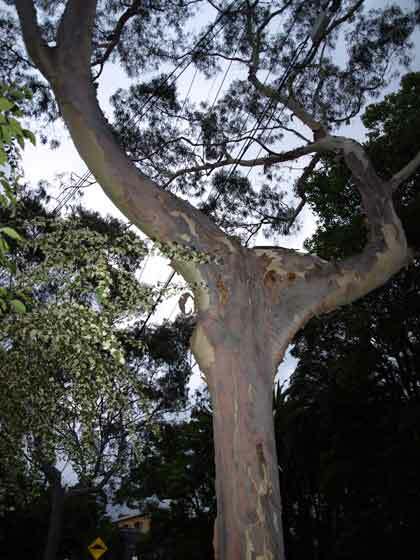 Council, say they will replace with a Dwarf apple (Angophora hispida), but as usual, don’t say when they will do this. This tree has multiple trunks (6), some with smaller branches higher up. Two of these grow over the footpath & property mingling with a young Fig tree in the front garden. The tree is lob-sided due to pruning for powerlines. In my neighbourhood, the size of the current 6 trunks is equal to the trunks of 6 individual trees . I disagree with Council that this tree will have “little amenity value” if it were pruned. 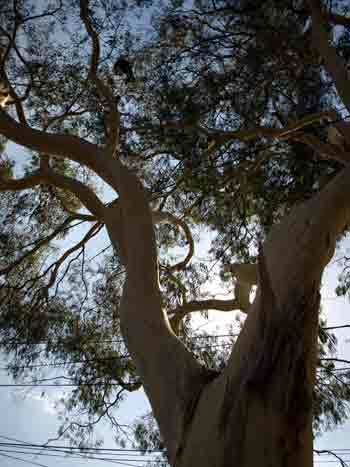 The fact is the canopy of thousands of street trees across Marrickville LGA look just like this tree. No they don’t look good, but they are ‘normal’ for this area. 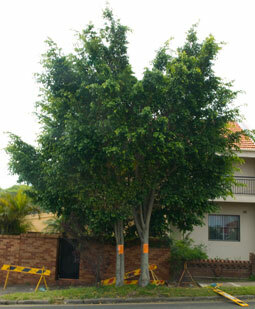 If Council believes that this tree should be removed, then the community should be prepared for thousands of other trees across the municipality to be removed. The 2 offending branches that hang over private property & make the tree lob-sided could be easily removed & there would still be a decent-sized street tree left, even if a little flat on top. If this tree were given time to re-grow its weeping habit, it would look fine. Bottle brush usually bounce back after even the most horrendous prune, though it can take a while. 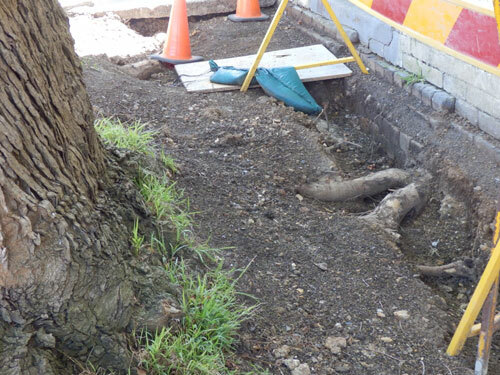 In regards to Council’s statement, “repeated damage to council’s footpath infrastructure by roots of the subject tree,” we saw that 2 joins in the concrete had been professionally grounded back to remove a trip hazard & this had been done in a number of places further along the footpath. 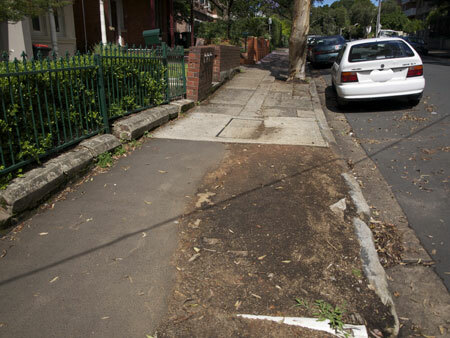 The footpath was almost flat, wheelchair accessible & in far better condition than the footpath outside our home or on many of the streets we walk. There is also the small issue of a young Fig tree in the front garden directly next to the tree. Cracking that appears to be caused by the Fig has already occurred to the fence. 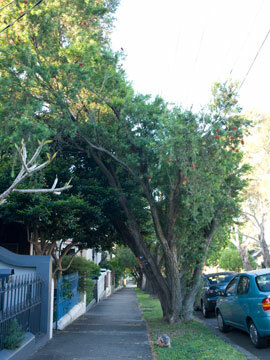 While the replacement Dwarf apple is a nice short tree (7-metres) that produces food for urban wildlife, this street is filled with Callistemon trees, many with multiple trunks like the current tree. I’m undecided about planting a different species when there seems to be a theme of street trees. It can look great. Then again, it can also look hotch-potch & this is something that people often complain about. The deadline for submissions is 9th November 2011. I don’t believe that this tree needs to be removed. * However, I won’t be sending in a submission, though I would support the local community if they wanted this tree retained. It does seem like a random loss when, after pruning, it will look like so many other trees across the municipality that happen to be under powerlines. This tree’s bad luck I suppose. * I have changed my mind. 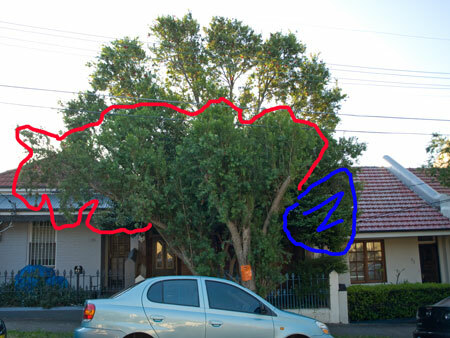 I will be sending a submission to Council against removing this tree for the above reasons. I found a 2009 TAFE paper that says, “Marrickville LGA is densely populated with 4,325 people per square kilometre & has the least amount of green space of any LGA in Australia.” This is an astounding statistic & with something like another 4,300 people going to live here as part of the last state government’s housing strategy, our green space will become even more important than it is now. Some of our larger parks are classified ‘active parks,’ that is, parks that are primarily used for organized sporting activities. As such, some residents feel they cannot use the parks for much of the time. Therefore, ‘passive,’ parks with playgrounds, picnic or grassed areas become very important to the non-sporting association community. Residents need both ‘active’ & ‘passive’ parks. Some like those along the Cooks River blend active & passive beautifully because of the size of the parks & access to the river. A number of our passive parks are beautiful & visiting them is worth a trip out. I will post about these over time. 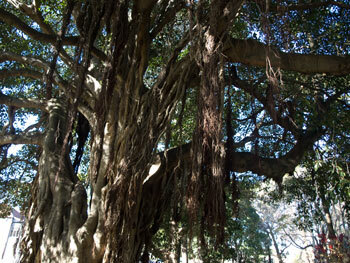 A beautiful mature Fig tree complete with a great set of aerial roots in Weekley Park. Council has planted another Fig tree recently. A couple of weeks ago we visited Weekley Park. Almost everything about this grand old historical park is beautiful in my opinion. Located between Percival, Albany & Clarendon Roads Stanmore, Weekley Park is full of large, tall trees & is laid out in grid pattern with every path meeting in the centre where there is a circle of very tall Canary Island palm trees. 20-years ago there used to be prolific flowering red, pink & white roses in the raised central garden, but instead there is now a few Nandinas with empty garden beds. Some of the roses in other garden beds that connect with the central paths are still here so hopefully they will continue to be retained. The Nandina look very ordinary & a bit scraggly in the centre feature garden that is supposed to bring the components of the park together. Perhaps one day when Council has the funds they might bring back the roses or plant something a bit more dramatic & beautiful that suits the park, though this is a matter of personal taste. Other people might like Nandina. They certainly sell at nurseries. Weekley Park is very popular green space as evident by the many people sitting in the shade on benches, on the grass or watching their kids play in the playground. Lots of people, including adolescents, were in groups or alone reading. It was nice to see. The park is also full of bird song & this coupled with the visual aspect of the many tall trees makes it quite a relaxing place. The playground equipment is new & there are toilets & drinking bubblers. You can take your kids for a while & have no need to rush home because someone needs to go to the loo. There are 2 large trees towards the centre that look to me to be in trouble, maybe even dead. It’s hard for me to tell because it is still winter. They have large areas of decay, holes & dead areas in the branches. Actually, these holes would make fine homes for urban wildlife, but I doubt that the trees will be allowed to stay. I hope when they do come down that they are replaced with equally large growing trees so the feel of the park can be retained. The rest of the trees are in great health & there is a nice variety that all seems to come together well & give a stately look to the park. 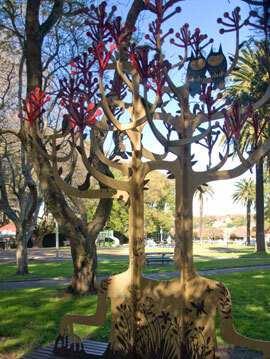 There is a great piece of public art called ‘Tree People’ that was created by artist Graham Chalcroft & installed in June 2009 as part of Marrickville Council’s public art strategy. I like it a lot. It’s whimsical & also functional as it includes double-sided benches. Year 5 students from St Michael’s Catholic Primary School collaborated with the artist by drawing the animals that are ‘the guardians of the park.’ Council contracted public art is popping up around the LGA in public spaces, which is very nice. One of the old Fig trees has the best aerial roots forming that I have seen in the LGA. It’s great that they have been left to grow & have not been chopped off. One day they will do what they are supposed to do & offer structural support to the branches when they grow larger. If you like parks, then I think you will like Weekley Park. It is worth paying a visit & spending some time. Dogs need to be on a leash & there are free poo bags supplied & a bin on site. There are a few chess tables with bench seats, loads of park benches all facing good views of the park. 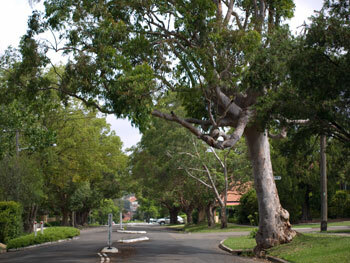 Council has recently planted quite a few new street trees on the verge that will also add beauty to the area. The intersection is a Box or Murraya hedge (I didn’t go close enough to see) & this too looks grand & lovely. Green intersections make any street look great in my opinion. All these things work unconsciously in the mind saying this is a nice area. One block away is the intersection almost everyone knows about. It is the hundreds of agapanthus & white roses at the roundabout at Salisbury Road & Northumberland Avenue. This was radical for the area in the mid 1980s & I remember a friend taking me from Balmain just to see it. It’s still there, though not in as good condition, but still giving a strong message that Stanmore is a nice area. I imagine some would wonder why I go on about such basic things like intersections. I do so because the majority in Marrickville LGA are concrete or concrete patterned bricks. Any green landscaping that softens the hard infrastructure is a plus in my opinion. I strongly believe that landscaping makes an area nicer as do a sufficient number of good-looking street trees. Some suburbs in Marrickville LGA have this as a norm while others look bare & somewhat harsh in comparison. This has an impact on how our society feels about an area or even a whole suburb. 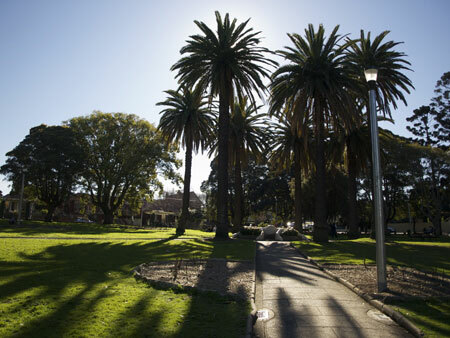 The centre of Weekley Park has a circle of mature Canary Island palm trees. There are also a couple of Canary Island palms at the perimeter. Instant charm. In the foreground are two rose gardens, dormant because of winter. Unacceptable damage to public & private infrastructure. Trees will continue to cause damage. They say they will replace these trees with 1 Watergum Tristaniopsis laurina, but again, don’t say when they plan to do this. I could write a post on its own about this species of tree being planted as a street tree or in small inner city gardens. It is generally sold as an ornamental potted plant in supermarkets because it looks impressive in a pot. I don’t often see it at nurseries. They were especially popular in pots either side of the front door in the 90s. While they are potted they look manageable, so if you think you want to plant one, ask yourself if you would plant a Moreton Bay Fig in your chosen site. Although the Moreton Bay Fig is a bigger tree at 24-30 metres tall, they are similar & therefore good as a comparison tree. If you have one of these, my advice would be to always keep it in a pot. In the ground in the wrong place is asking for trouble. I identified these particular trees as trouble with a limited life last year shortly after starting SoT so I am not surprised to see them on the removal list. Right now they are only babies. I will not be putting in a submission. The deadline for submissions is Tuesday 12th October 2010.